Hudson Randall – RHP – Florida – Jr. 6.2IP 6H 2ER 0BB 6K. (W, 3-0). Steven Rodriguez – LHP – Florida – Jr. .2IP 0ER 0BB 0K. Michael Roth – LHP – South Carolina – Sr. 6.2IP 5H 2ER 2BB 6K. Forrest Koumas – RHP – South Carolina – So. 0IP 0H 0ER 1BB 0K. Kevin Ziomek – LHP – Vanderbilt – So. 4.1IP 5ER 2BB 1K. (L, 2-2). DJ Baxendale – RHP – Arkansas – Jr. 5.1IP 5H 1ER 2BB 4K. Kevin Gausman – RHP – LSU – So. 8.2IP 4H 1ER 4BB 11K. Bobby Wahl – RHP – Mississippi – So. 6IP 6H 0ER 1BB 6K. (W, 4-0). Alex Wood – LHP – Georgia – So. 4IP 4H 0ER 0BB 3K. Ian Gardeck – RHP – Alabama – Jr. 1IP 0H 0ER 2BB 1K. Taylor Rogers – LHP – Kentucky – Jr. 5.2IP 8H 2ER 2BB 4K. Kentucky with a HUGE home win over South Carolina to improve to 19-0. Kent Emanuel – LHP – North Carolina – So. 7.1IP 8H 3ER 1BB 7K. (W, 5-0). Buck Farmer – RHP – Georgia Tech – Jr. 7IP 6H 2ER 2BB 7K. (W, 4-1). Kevin Brady – RHP – Clemson – Jr. 6.2IP 5H 3ER 5BB 9K. (W, 1-1). Tim Cooney – LHP – Wake Forest – Jr. 5.1IP 9H 5Er 6BB 4K. (L, 3-2). Marcus Stroman – RHP – Duke – Jr. 7IP 6H 1ER 2BB 13K. (W, 2-2). Nice win for likely 1st Rounder against Miami. Michael Wacha – RHP – Texas A&M – Jr. 5.1IP 11H 8ER 3BB 5K. Not sharp against Kansas State. 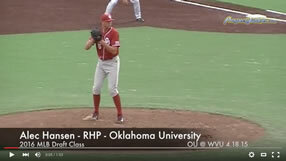 Dillon Overton – LHP – Oklahoma – So. 6IP 9H 3ER 2BB 4K. Andrew Heaney – LHP – Oklahoma State – Jr. 9IP 3H 0ER 0BB 8K. (W, 4-1). Corey Knebel – RHP – Texas – So. 2.2IP 3H 1ER 0BB 2K. Hoby Milner – LHP – Texas – Jr. 2.1IP 3H 1ER 1BB 2K. (W, 2-3). Parker French – RHP – Texas – Fr. .2IP 0H 0ER 0BB 1K. (S, 2). Rob Zastryzny – LHP – Missouri – So. 5.2IP 9H 4ER 0BB 5K. Brady Rodgers – RHP – Arizona State – Jr. 8IP 10H 4ER 0BB 2K. Jake Barrett – RHP – Arizona State – Jr. .2IP 1H 0ER 0BB 1K. (L, 1-2). Kurt Heyer – RHP – Arizona – Jr. 5.2IP 8H 3ER 2BB 2K. (L, 4-1). Adam Plutko – RHP – UCLA – So. 7.1IP 4H 5ER 3BB 3K. Matt Carasiti – RHP – St. John’s – Jr. 6.2IP 6H 1ER 0BB 7K. (W, 1-2). Justin Amlung – RHP – Louisville – Jr. 7.2IP 5H 1ER 2BB 9K. Matt Koch – RHP – Louisville – Jr. 1.1IP 3H 1ER 0BB 1K. (S, 4). Randy LeBlanc – RHP – Tulane – So. 4IP 8H 3ER 1BB 2K. Aaron Blair – RHP – Marshall – So. 6IP 6H 2ER 2BB 3K. (L, 1-3). Ben Lively – RHP – Central Florida – So. 5IP 9H 3ER 1BB 6K. Dylan Florio – RHP – Cal State Fullerton – Jr. 8IP 7H 1ER 1BB 5K. (W, 2-2). Shawn Stuart – RHP – Long Beach State – Jr. 5.2IP 6H 0ER 2BB 4K. Alex Muren – RHP – Cal State Northridge – Jr. 7IP 2H 1ER 4BB 3K. (W, 4-1). Matt Anderson – RHP – Long Beach State – Jr. 6IP 5H 2ER 3BB 2K. (L, 1-1). Michael Lorenzen – RHP – Cal State Fullerton – So. 1IP 1H 0ER 0BB 0K. (S, 7). Andrew Thurman – RHP – UC Irvine – So. 7.2Ip 4H 1ER 0BB 7K. (W, 1-1). Sam Wolff – RHP – New Mexico – Jr. 4IP 8H 6ER 1BB 1K. Michael Cederoth – RHP – San Diego State – Fr. 4.2IP 9H 3ER 3BB 2K. Chris Beck – RHP – Georgia Southern – Jr. 7.2IP 9H 2ER 3BB 9K. (W, 2-2). Jon Moscot – RHP – Pepperdine – Jr. 9IP 9H 2ER 1BB 9K. (L, 3-2). Michael Wagner – RHP – San Diego – So. 2IP 0H 0ER 0BB 4K. (S, 10). Colin Welmon – RHP – Loyola Marymount – Fr. 7IP 3H 0ER 0BB 3K. (W, 2-1). Dylan Covey – RHP – San Diego – So. 4IP 4H 1ER 3BB 1K.